We're turning 10 this month and wanted to say thank you to all our wonderful and loyal customers like you. 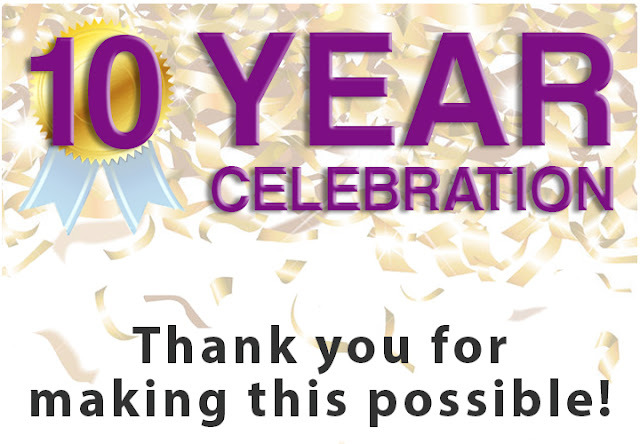 Over the past 10 years we have had the pleasure of serving so many customers. Some of you we get to talk to on the phone or emails and some we even get to meet in person at our events or shows. Either way it has been a pleasure for our entire team. A decade is a long time. Few things in our lives or in the world last that long--the average online startup doesn't quite make it two years. I'm honored and humbled that you've stuck with us all this time, and I promise that in the decade ahead, beautystoredepot will continue to deliver the best products, at the best prices, and with the best service. And in case you missed the invite last week, don't forget to join us Thursday to celebrate our anniversary! Not only are we celebrating a decade of decadence, but we are also going to be giving 100% of the proceeds from our silent auction to Dress for Success Austin! See our last blog post for details about the event or check us out on Twitter, Facebook, and Instagram!